Each student's spiritual walk is important at St. Rita School. We weave religious and spiritual activities into all we do. Our students participate in First Friday Masses, May Crowning, and the Enthronement of the Sacred Heart of Jesus. Students and teachers plan and participate in daily prayer, sacramental programs, prayer services, and monthly school masses. We list Masses and prayer services on the school calendar and encourage parents and other visitors to attend these prayerful experiences. All students participate in a wide variety of community service and charitable events throughout the year that benefit families in the greater New Haven community as well as our worldwide community. These annual events include food drives, clothing and toy drives, and monetary donations to organizations such as Children of Light and to victims of natural disasters. Various religious communities have served St. Rita School. First, the Sisters of Notre Dame de Namur, then the Dominican Sisters, and now the Apostles of the Sacred Heart of Jesus, who continue to serve our school. Numerous pastors have been and continue to be committed to providing a solid Catholic education for the students of St. Rita School. Prayer is vital to the St. Rita School community. The school community begins and ends the day with prayer, and each class within the school day also begins with prayer. Well-planned liturgical experiences, in accordance with approved liturgical norms, form an integral part of the religion curriculum of each grade throughout the school year. The Celebration of the Eucharist ordinarily takes place on the first Friday of each month and on Holy Days of Obligation during the school year. Each grade level has the opportunity to plan a Liturgy, and all faculty and students participate. Students and faculty also gather for prayer as a community for prayer services during various liturgical seasons. Sacramental celebrations are parish celebrations and as such, properly belong in the parish where the student and family worship each weekend. Our second graders prepare for the sacraments of Reconciliation and Holy Eucharist through daily classroom instruction. In addition, we expect students to participate in special workshop days and the programs of celebration. Parent meetings in preparation for these sacraments are an important part of this preparation, and all parents should be attending. Children who are not members of St. Rita Parish need the permission of their own pastor to celebrate these sacraments at St. Rita Church. 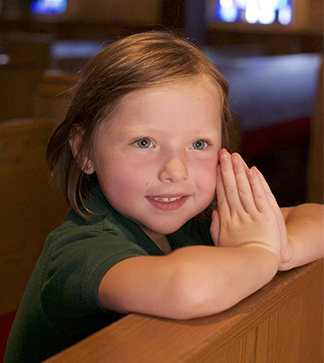 Opportunities to celebrate the Sacrament of Reconciliation are available throughout the year.